Reading and share top 13 famous quotes and sayings about Highbrow by famous authors and people. Browse top 13 famous quotes and sayings about Highbrow by most favorite authors. 1. 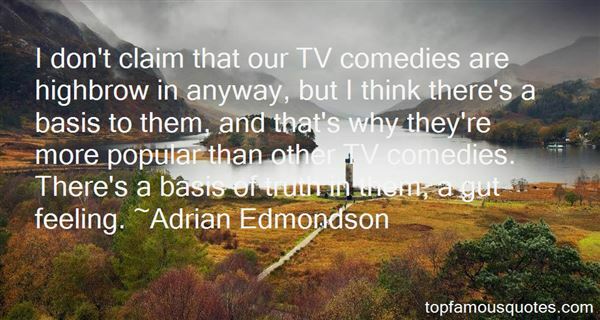 "I don't claim that our TV comedies are highbrow in anyway, but I think there's a basis to them, and that's why they're more popular than other TV comedies. There's a basis of truth in them, a gut feeling." 2. "Highbrow Fiction: Since the invention of genre fiction, relegated from attention space to shelf space, then finally to empty space when no new editions are put out. The first category of literature in which the ideal reader and the real reader are one and the same – the writer." 3. "In Catholic countries we saw (and sometimes still see) a large number of illiterates side by side with an intellectual élite of high standards. The Protestant goal of education is usually one of good averages- the optimum for a democracy. In democracies there will always be resentment and contempt for the "highbrow" and the illiterate, the intellectual and the "peasant." 4. "I personally do not write highbrow music. If I do, it's by accident." 5. "Even those novelists most commonly deemed "philosophical" have sometimes answered with an emphatic no. Iris Murdoch, the longtime Oxford philosopher and author of some two dozen novels treating highbrow themes like consciousness and morality, argued that philosophy and literature were contrary pursuits. Philosophy calls on the analytical mind to solve conceptual problems in an "austere, unselfish, candid" prose, she said in a BBC interview broadcast in 1978, while literature looks to the imagination to show us something "mysterious, ambiguous, particular" about the world. Any appearance of philosophical ideas in her own novels was an inconsequential reflection of what she happened to know. "If I knew about sailing ships I would put in sailing ships," she said. "And in a way, as a novelist, I would rather know about sailing ships than about philosophy." 6. "There's all this stuff that is happening in Edinburgh now, it's a sad attempt to create an Edinburgh society, similar to a London society, a highbrow literature celebrity society." 7. 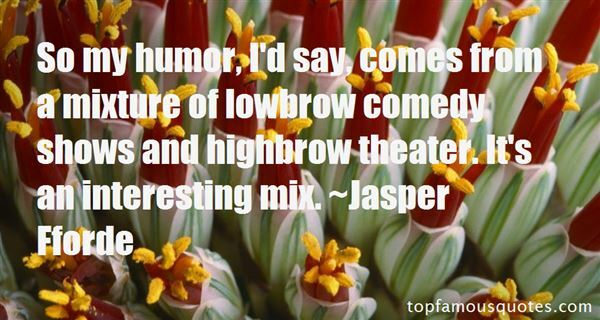 "So my humor, I'd say, comes from a mixture of lowbrow comedy shows and highbrow theater. It's an interesting mix." 8. "But the not-very-highbrow truth of the matter was that the reading was how I got my ya-yas out.For the sake of my bookish reputation I upgraded to Tolstoy and Steinbeck before I understood them, but my dark secret was that really, I preferred the junk. The Dragonriders of Pern, Flowers in the Attic, The Clan of the Cave Bear. This stuff was like my stash of Playboys under the mattress." 9. "It's just human, or inhuman, nature: People will find a way to make a big deal out of their differences-the smaller, the better. 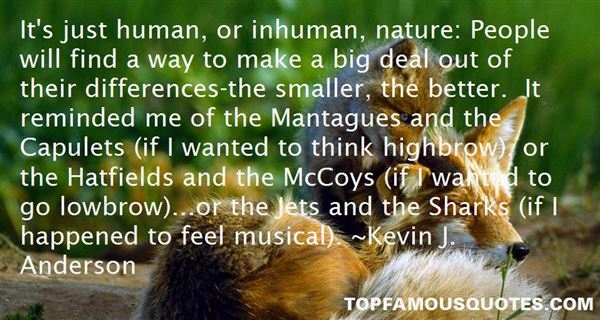 It reminded me of the Mantagues and the Capulets (if I wanted to think highbrow), or the Hatfields and the McCoys (if I wanted to go lowbrow)...or the Jets and the Sharks (if I happened to feel musical)." 10. "I don't know what people find or like in me, I'm hopelessly commonplace! Current appreciation of my work is a bit highbrow, I've always considered myself a popular artist." 11. "The attitude which the man in the street unconsciously adopts towards science is capricious and varied. At one moment he scorns the scientist for a highbrow, at another anathematizes him for blasphemously undermining his religion; but at the mention of a name like Edison he falls into a coma of veneration. When he stops to think, he does recognize, however, that the whole atmosphere of the world in which he lives is tinged by science, as is shown most immediately and strikingly by our modern conveniences and material resources. A little deeper thinking shows him that the influence of science goes much farther and colors the entire mental outlook of modern civilised man on the world about him." 12. "On the whole, Flora liked it better when they were silent, though it did rather give her the feeling that she was acting in one of the less cheerful German highbrow films." 13. "When highbrow critics accused Time of practicing personality journalism, Luce replied that Time did not invent the genre, the Bible did." Above literature?' said the Queen. 'Who is above literature? You might as well say one was above humanity."